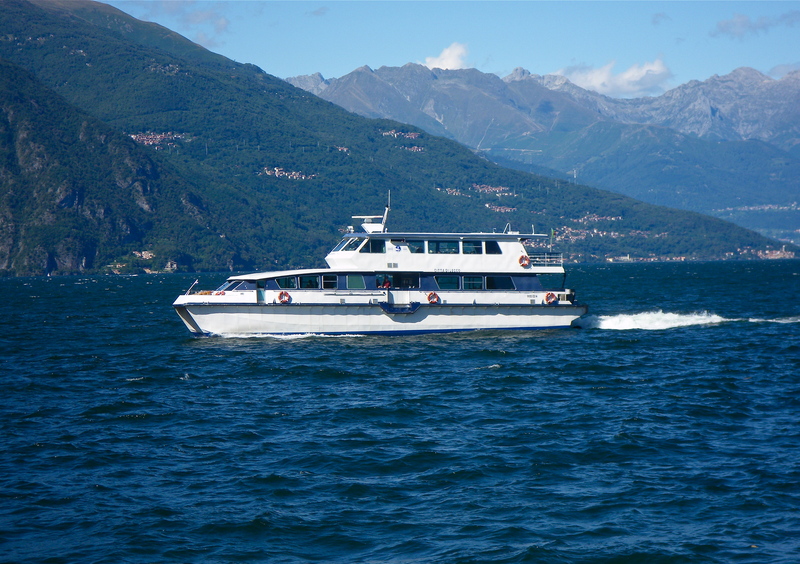 There are several boats called “Rapido” on the timetables that can save hours of lake travel from one end to the other. Built locally in the early 2000s at the Navigazione Lago di Como shipyard at Tavernola (a little north of Como City on the westbank) there are 3 catamarans of this style in operation. Air conditioned & seating 160 passengers, don’t take the ‘rapidos’ if you want to take nice photos as there is no outdoor seating. Pictured here is the Città di Lecco leaving the Bellagio dock and not fully zooming along yet. What a beautiful day to be on the lake! ~ by mylakecomo on August 31, 2013. Have you gone on them? Do you prefer to take the boats where you can be on the outside and take photos, or do you prefer the Rapidos? Hi – After so many years, I think I have now been on all the boats. I did take a ‘rapido’ just this week on my way to visit the Hotel Aurora & Margherita in Lezzeno. It is the best way to get there from Menaggio. Thanks for looking!